The world’s first gaming smartphone with a 3D vapor cooling system has finally launched in India on Thursday. 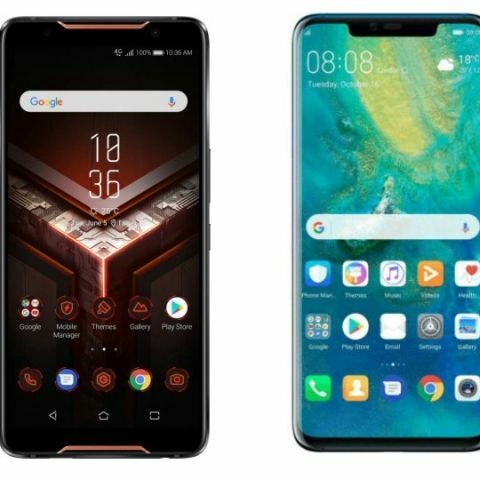 We are comparing the device with the Huawei’s latest Mate 20 Pro to see which flagship device would win the battle when it comes to specifications. The Asus has announced its gaming smartphone “Asus Rog” back in July this year at Computex 2018. The phone has been finally launched in India this Thursday. The smartphone comes with an AMOLED display and a 90Hz refresh rate. On the other hand, the Huawei Mate 20 Pro, which has been released with a triple camera setup at the back is priced at Rs 69,990 in India. Let’s start with a quick specification comparison to know which flagship device packs a better hardware under its hood. The Asus Rog gaming smartphone sports a 6.0-inch display that offers a resolution of 1080 x 2160 pixels. On the other hand, the Huawei’s Mate 20 Pro, which comes with a bigger 6.39-inch display offers a resolution of 1440 x 3120 pixels. 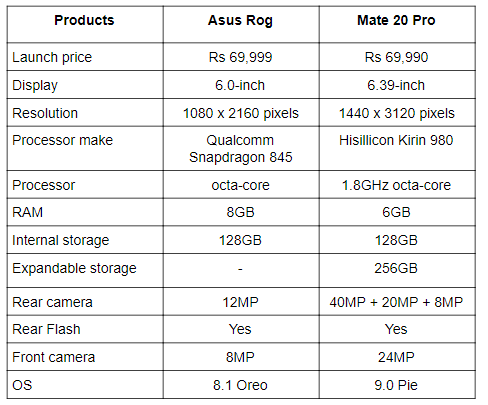 When it comes to the processor, the Asus Rog is powered by a Qualcomm Snapdragon 845 processor, while the Huawei’s Mate 20 Pro is backed by a Kirin 980 octa-core processor. As far as the cameras are concerned, the highlight of Huawei’s Mate 20 Pro is its cameras as it comes with a triple 40MP + 20MP + 8MP camera set up at the back along with a 24MP front shooter. On the other hand, the Asus Rog features a single 12MP unit at the back with an 8MP sensor on the front. The Asus Rog is a completely different device as it is specifically designed for gamers. The phone would be ideal for those who play a lot of games in their smartphone. On the other hand, if you’re looking for a device with a bigger display and a better camera then the Huawei Mate 20 Pro might fit the bill.